Posted June 22, 2015 by Heather Michet & filed under Drinking Water, Water. How’s this for a scary fact: ER visits are way up – especially in men over 40. Want to know why? 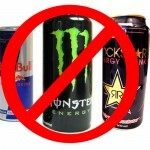 Massive consumption of energy drinks. You know the ones I’m talking about – the super sweet, caffeine-jacked “beverages” that give you a false sense of increased energy. Drinking one of these seems like it should be no big deal, but the caffeine load can increase your heart rate and blood pressure, and the super sugar content inhibits blood flow. All of these can result in symptoms that mimic a heart attack. Yikes! When your energy starts to wane, reach for a tall glass of filtered water because it’s quite likely you are dehydrated. Dehydration causes your body to conserve energy by decreasing blood circulation. This deprives your muscles of oxygenated blood and causes you to become fatigued. Even mild dehydration can make you feel lethargic. The next time you’re feeling slogged out, choose my beverage of choice – water. If water doesn’t sound appealing, try some Toning Water. All of your body’s systems will thank you.